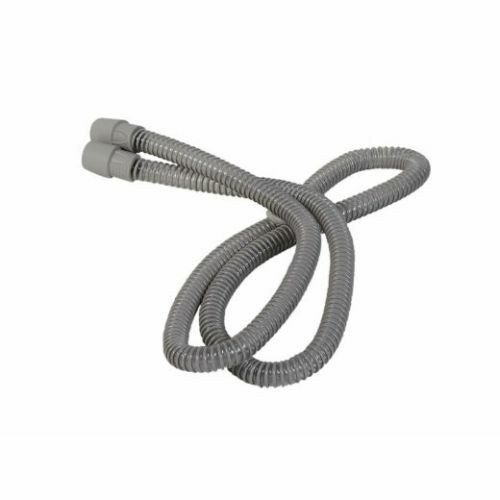 The 6' 22 mm Tubing for DeVilbiss SleepCube is ideal for those who need replacement or additional tubing for their SleepCube CPAP Device. The SleepCube range of CPAP devices from DeVilbiss are used for the treatment pathways for those who have been diagnosed with Sleep Apnoea. The SleepCube range features the Standard, Standard Plus, Auto Plus, BiLevel ST and AutoBiLevel units. All of the SleepCube CPAP range are available with integrated humidification. Drift off to sleep with ease; the SleepCube range of CPAP's are whisper quiet, enabling a more refreshing nights sleep for the user. Sleep Apnoea is a sleep disorder and is also referred to as Obstructive Sleep Apnoea (OSA). When you are asleep, it is normal to have some relaxation of the soft palette at the back of the throat, and it is this vibration of tissues at the back of the throat contributing to snoring. Sleep Apnoea occurs when the airway is relaxed to the point of obstruction of complete collapse, blocking airflow into your lungs and stopping your breathing altogether while you are asleep. The obstruction or complete collapse of your airway occurs repeatedly throughout the night, with each episode lasting anywhere from a few seconds to more than a minute. As your blood oxygen levels drop during an episode, your body signals you to wake up, triggering a sudden gasp for air. When this happens, you are partially woken from your sleep to intake a breathe of air. As you can imagine, continued cycles of this cause many negative side effects. Those who are diagnosed with Sleep Apnoea often experience fatigue, daytime tiredness and feel stressed and irritable the next day. Sleep Apnoea prevents you from experiencing the sustained, deep sleep your body needs. It is a sleep disorder which affects many areas of life. Sleep Apnoea side effects are varied and untreated it can potentially result in increased risk of memory loss, impotence, hypertension, coronary disease, strokes and heart attack. Undergoing CPAP Therapy for Sleep Apnoea has proven to be an effective treatment for preventing the cycles of airway obstruction and oxygen deprivation. Occasionally, you may need to replace an accessory or will require a new accessory for your CPAP machine. You will find a wide range of CPAP device accessories designed for you to get the most out of your CPAP therapy. The DeVilbiss SleepCube 6' 22 mm Tubing is compatible with Devilbliss SleepCube CPAP machines. Sleep Apnoea Services are your number one resource for Sleep Apnoea information, products and product support. Browse our range of CPAP machines, Data Transfer, Power Supplies, Masks, Mask Accessories, Hoses, Tubes and much more.